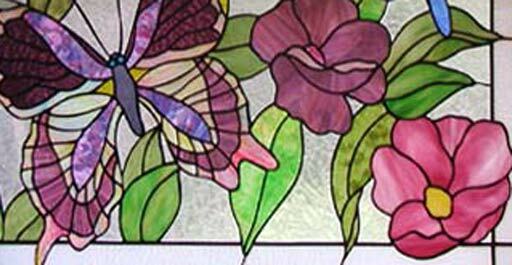 AINSLEYS BUTTERFLIES | Stained Glass Butterflies, Flowers Window Custom Glass Design. "AINSLEY’S BUTTERFLIES AND FLOWERS" STAINED GLASS WINDOW HANDCRAFTED BY JACK McCOY©. 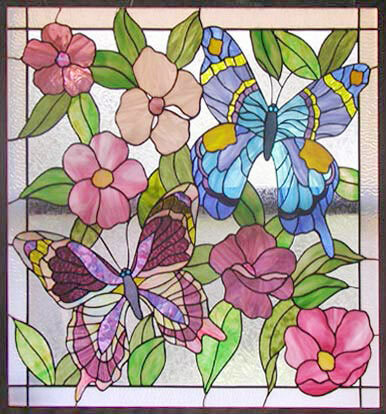 This stained glass butterflies and flowers window was 36" x 36". Opalescent stained glass with a background of gluechip glass.